This is another game written by an individual who we have had the good fortune to interview. Giddy 2 is the sequel to Wibble World Giddy by Phil Ruston. For those of you unware of the Giddy games they are basically Dizzy World Clones. Therefore the gameplay involves collecting items and using them on other objects to solve problems and progress through the levels. The game contains the same cute graphics and chirpy music of the first game. It is very much a case of more of the same, so if you enjoyed Wibble World Giddy then you are probably going to enjoy this game too. The main difference between Giddy 2 and its predecessor is that is probably double the size. However with the game being Pd don't expect hours of game play. You should be able to complete this game within half an hour and if you are an experienced game player you could probably rush through in 20 mins or less. Overall this is a cheery game and it is difficult not to raise a smile as the game loads and you are greated by the jolly music and ridiculous image of Giddy and his enormous hands. It makes a nice change to have a game which doesn't take itself to seriously or tries to take you to a world where everything is ultra realistic. This is a pleasant return to a time in gaming when programmers created games for people to escape from the real world for a few minutes and have uncomplicated fun. When AmigaPd launched we made Wibble World Giddy are recommended game for that month. That was before we had a regular monthly page. If you watch both videos for the Giddy games you will clearly see the similarities but hopefully also see the charm and fun of the game. If after playing both games you still have not had you fill of Giddy induced fun then check out the interview with Phil Ruston to learn about how you can play Giddy 3. One of the first Amiga Public Domain programmers to contact us was Kevin Gallagher. He became the second person we interviewed and he was very generous and supportive, providing us with our a disk image of his updated games. The games Kevin worked on all tend to be based on the old arcade classics and they don't come much older than Gorf. This is real retro space invaders and captures everything perfectly. Whether you think this makes a good game probably depends on your age. Older gamers who remember spending endless 10ps at seaside arcades will probably looking fondly through misty eyes at the single screen and the arched shield protecting your ship. Younger players may wonder all the fuss is about and find the repetitive, simplistic game play a turn off. If you like the single screen space invaders and long for the old arcade of the early 1980s then give this a go. If you a looking for a fast pace scrolling shoot em up then stick with Deluxe Galaga. Either way definately read the interview with Kevin Gallagher because he has written games some cracking games and there should be something in his collection for everyone. There is an individual on the EAB forum who is providing some great work in raising the profile of Amiga Public Domain games. He goes by the user name S2325 and recently he has started uploading videos of Public Domain videos to Youtube. He has kindly agreed that we can use them. Above is one of his videos. It is for a tetris clone called - Giger Tetris. Watch the video and you will get a good idea of whether you want to play this clone - The main drawback of this clone is that it has no multiplayer game and for that reason cannot be achieve more than 3 stars. I am probably showing my age by revealing that the first computer I used as a child was the BBC Micro during the 1980s. The UK seemed computer mad at the beginning of that decade and schools seemed to have a lot of cash to spend on these very expensive machines which probably would have cost double of a current PS3 in relative terms. Whilst the BBC Micro may be remember unfavourably for all those horrible education programs that schools forced children to complete, if you knew the right school children you could often get a disk containing some more enjoyable games. One such game was Thrust which seems to have provided the inspiration for the one player missions for this game, Gravity Force. Thrust involved you moving a vector ship around caves trying to locate an orb which once you collected you had to navigate your way back out of the caves. Your ship only had a limited amount of fuel and therfore you had to use your thrusters sparingly as whilst there may be extra fuel available in the maze of caves it added unnecessary risks to your misisons. The caves were also dificult to explore as you would encounter enemy ships who would shoot on sight. All these features have made their way onto the Amiga version Gravity Force. 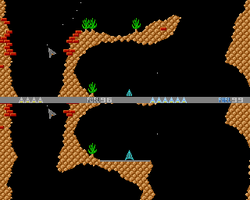 The graphics have been improved as the sprites are now solid rather than simple lines. The one change is that instead of collecting an orb you have to collect what appear to be boxes. This has changed the game play as the difficulty of collecting the orb is that it swung around beneath your ship making your escape from the cave that more difficult as if the orb hit the cave wall it would lead to your ship exploding as well. This made the game much more challenging or frustrating depending on how many times you were repeating that paticular level. The main difference between Gravity Force and Thrust is the inclusion of a 2 player game. This is probably the part of the game which Gravity Force is best remembered for. The 2 player game is a death match or dog fight through the caves. It is this part of the game which will have you shouting at the screen, throwing your joystick at the floor and disowning your brother / sister / friend. Don't worry though, due to the addictive nature of this two player game you will soon make up, just so you can play them again with the hope of blasting them out of the universe. For those of you who never played the original Thrust game, check out the video below taken from the BBC Micro. Those of you seeking a closer update of this game may prefer to play Fluech.